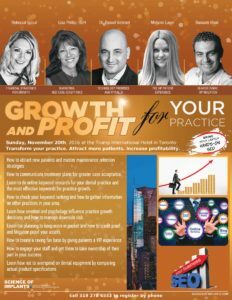 This course will help you transform your practice, attract more patients, and increase profitability. How to attract new patients and master maintenance retention strategies. How to communicate treatment plans for greater case acceptance. Learn to do online keyword research for your dental practice and the most effective keywords for practice growth. How to check your keyword ranking and how to gather information on other practices in your area. Learn how emotion and psychology influence practice growth decisions and how to manage downside risk. Learn tax planning to keep more in pocket and how to credit proof and litigation proof your assets. How to create a raving fan base by giving patients a VIP experience. How to engage your staff and get them to take ownership of their part in your success. Learn how not to overspend on dental equipment by comparing actual product specifications. Charlesdop on How Successful is Peri-Implantitis Treatment?